The cairn marks the site where Stuart and his party camped on 11th July 1862. 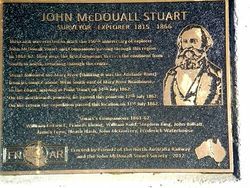 The event celebrates 150 years since explorer John McDouall Stuart arrived on Australia's northern shore, being the first successful expedition by an explorer to cross the continent from south to north. This cairn was erected to mark the 150th anniversary of explorer John McDouall Stuart and companions passing through this region in 1861 - 62. They were the first Europeans to cross the continent from south to north, returning through the centre. 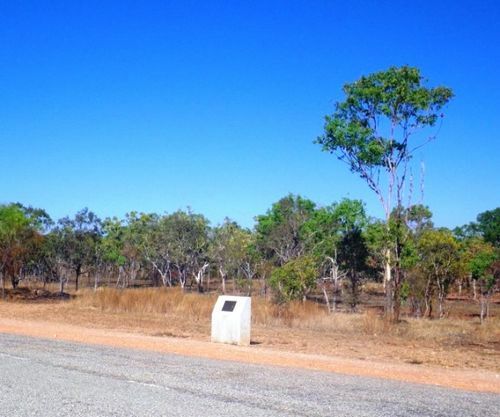 Stuart followed the Mary River (thinking it was the Adelaide River) from its source about 30km south-east of Mary River Roadhouse, to the coast. On the northwards journey, he passed this point on 12th July 1862 and reached the coast at Point Stuart on 24th July. On the return jouney the expedition passed this location on 31st July 1862.